"Hope comes with letting go." 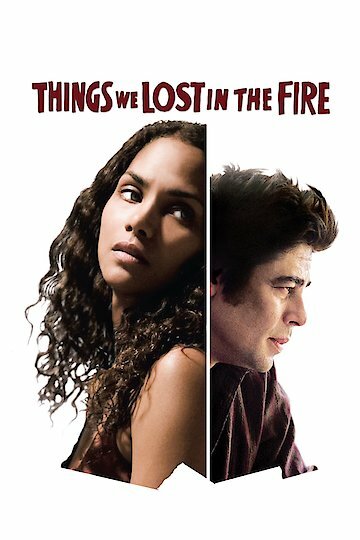 Things We Lost in the Fire is a dramatic movie that was released in 2007. It was directed by Susanne Bier, and it was written by Allan Loeb. The film stars Halle Berry as Audrey Burke, and Benicio del Toro as Jerry Sunborne. The supporting cast consists of David Duchovny, Alexis Llewellyn, Micah Berry, John Carroll Lynch, Alison Lohman, and Robin Weigert. The film has a running time of 118 minutes, and it was produced by Sam Mendes. The film was awared an R rating for its depiction of drug use, and its language. The movie opens up establishing the married life of Audrey and her husband, Brian. They have a son and a daughter. Plus, they have to deal with Jerry, who has known Brian since they were children. These days, Jerry is a drug addict. One day, Audrey is informed by the police that her husband has been killed. It slips her mind to notify Jerry of the news, but her brother goes to pick him up. After the funeral she asks Jerry if he would like to move in with them. However, he needs to stay of drugs, and he can't really commit to that promise. Despite his shortcomings, he gets along really well with the kids. Audrey and Jerry don't get along that well, but he helps her in mourning the death of Brian. As Jerry becomes more of a father figure to the children, it angers Audrey. She is upset that these are things Brian was working on before his untimely death. The misery even causes Audrey to blame Brian's death on Jerry. The fighting and stress it causes leads to Jerry leaving and going back to drugs. The rest of the film is about Audrey and Jerry recovering, but first Audrey must accept that she should be a better friend to Jerry. Things We Lost in the Fire is currently available to watch and stream, buy on demand at Amazon, Vudu, Google Play, FandangoNow, iTunes, YouTube VOD online. If you've wondered where actor Benicio del Toro has been for the last few years (and you didn't see "Che"), we've got your answer. Del Toro's rep, Robin Baum, tells Life & Style magazine that "Kimberly is pregnant. Although they are not a couple, they are looking forward to the arrival of the baby.